Pure elegance of design and superb craftsmanship for this stunning trio of decorative hand towels! These lovely towels are loomed of a pure white, fine and very supple linen known as "granite" for its subtly textured surface. A jewel-like monogram is centrally embroidered in both high relief and open-work lace with two superimposed initials which I believe are "BG" or "GB" (but could pass just as well for "CB" or "BC"). 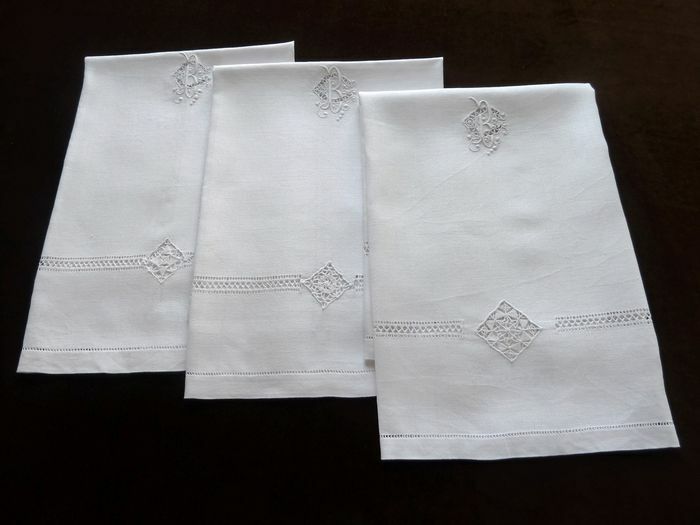 The perimeter of each towel is framed with elaborate drawn-thread embroidery, a delicate hem-stitch, and four diamond-shaped inserts of Venetian lace, echoing that of the monogram. A lovely touch is that each of the lace inserts has a different motif! Very likely dating from the end of the 19th century these stunning towels are in impeccable condition! One additional set of three towels is available upon request. Dimensions: 29.5 x 28.5in.